Although the Torah assures us numerous times that the righteous will be rewarded and that evil will be punished in this world, our actual experience often does not seem to bear this out. Rabbi Yanai is honest enough to admit that he does not understand how his experience in the world is consistent with the Torah's statements. He believes the Torah is the ultimate truth, and yet the world seems to have wicked people who appear content, and righteous people who suffer? We will address this issue of fairness, but first we must pose a more basic question. Why is there any evil at all? If God if beneficent, why would he create evil? Before we examine the question of why God would create evil, it would be reasonable to first establish that he did, in fact, create it. The Bible implies that God did create evil. It is written in Isaiah 45:7, "He forms light and creates darkness, makes peace and creates evil." Yet, despite this verse, some theologians, including Maimonides, deny that God ever created evil! How then did evil come into the world? Maimonides claims the world was created incomplete. All that God created was good, but he did not create all that he could have. What he created was not created in the most complete fashion. For instance, he created some people missing limbs. What he created was good as far as it went, but it was what was not created or perfected that caused the pain and evil. What God did not do is the source of the problems, not what he did. Maimonides, of course, does not say the verse in Isaiah is untrue - he only interprets it in his own peculiar way to supports his theory. He says the word Isaiah uses in reference to evil is "Borey" (creates). This term, Maimonides says, is always used in the Bible to point to the negative. It is used in the first sentence in the Torah, "In the beginning God created," to emphasize the negative, to emphasize that the creation was out of nothing. By using this term in reference to the creation of evil, Isaiah is implying that the creation of evil was not a positive creation, but resulted from a "negative," from the lack of action. God did not fully complete and perfect the creation, so there was space left for evil. While Maimonides' explanation of Isaiah's words seems a bit forced, the idea that God did not create evil directly has gained acceptance by many religious thinkers. Let's look at the Kabbaistic approach. The idea that in the divine worlds no evil exists is a fundamental Kabbalistic tenet, and is stated repeatedly in Kabbalistic texts. The Biblical verse (Psalms 5:4) is often quoted as proof, "Evil will not dwell with you." This is taken to mean that in the worlds where the divine light shines unaltered, no evil can exist. After all, the divine light is God's will, and God wants only good. The first of the non-divine "separated" worlds, according to Kabbala, is Olam HaBriya (The world of Creation). This world serves as the throne upon which the divine realm sits. It is called the Throne of Glory (Kisay HaKavod), and is an unlikely place for evil to have developed. The world below the Throne is called Olam HaYitsira. It is the world of the angels. There is some question in this world about the possible existence of evil. Angels are spiritual beings, created specifically to be messengers for God and to do his bidding. Angels, therefore, are often thought to have no free will. If this is true, then evil would be impossible here. However, there are several stories in Jewish literature about fallen angels. Targum Yonatan ben Uziel even supplies the names of two of these. These angels are mentioned in Yonatan ben Uziel's Targum, Genesis 6:4. They are Shamchazohay and Uzeeyel, and they are described as having "fallen" from the sky. The implication is that their fall was due to sin. There are several other accounts in religious literature that even provide the details of the punishment angels received for specific transgressions. These stories imply that angels can exercise free choice and are sometimes capable of evil and rebellion. Of course, there are angels like the angel of death, and Samael, who clearly represent evil. They are really not angels in the same sense as the angels of Olam HaYetsira. They belong to the bottom of the lowest world. They are sometimes called angels only in that they, at times, can be messengers to do God's bidding. The world where evil really takes root is our world, Olam HaAsiya. This is the realm of free will, where God allows "space" for other wills to operate. This is where what happens is not totally dependent on God. The Talmudic rabbis have said, "All is in the hands of heaven except for the fear of heaven." The fear of heaven is up to man, not God. If man chooses not to fear God, he can create evil. Freedom is a wonderful thing, but it also is that which makes evil possible. 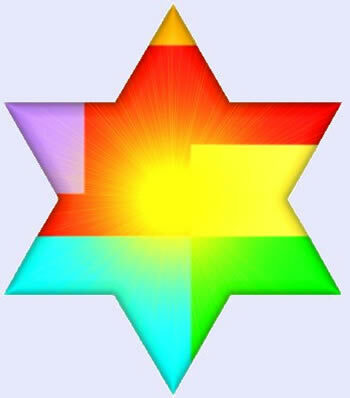 Lurian Kabbala provides a visual model to portray the divine will. G-d's will is pictured as infinite light. Originally this light was everywhere, but G-d contracted it to create an empty global area in the middle of the light. That is, an area absent of G-d's will. No evil was possible before the empty space was created, because all the space was filled with divine light. The space created by the light's recession, however, created a vacuum, and although some divine light entered the vacuum, it also provided the room for evil. Incidentally, many Kabbalists believe that the global area was not totally empty. They believe a slight impression (resheemu) of the previously present infinite light remained. This means that God's will remains hidden behind the scenes even in the darkest void. The implication is that even though free will was allowed here, it is nonetheless limited. In the end, God's intent will dominate. The term "free will" has been used extensively in philosophic and theological works. It is usually assumed that the meaning of the term is clear, but, in truth, the term is often used in different ways, depending on the user and the context. Therefore, it should be helpful to clarify what is meant by "free will" in our discussions here. A person does not create himself, nor does he create his environment. The person that supposedly has total free will is not truly responsible for what he is at the moment that he exercises his free will. What he is is not his doing alone, but results from the actions of God, who provided both his body and his environment. The difficulty of assigning ultimate responsibility to humans for their deeds is a major problem for theology and will not be solved here. People are never truly independent of their maker, who is the root of all things. However, the fact that God is the root of man, perhaps is what provided the impression (risheemu) that remained after the light was evacuated from the center of the Ein-Sof. Ultimately, even after the creation of the empty global area, God remains in charge. Leonard Glotzer recently published his second book on Jewish Mysticism, The Kabbalistic system of The Ari. It provides the essentials of the kabbalistic system of the famous 16th Century mystic Rabbi Isaac Luria. More information is available on his website www.outskirtspress.com/glotzer and on www.Amazon.com.